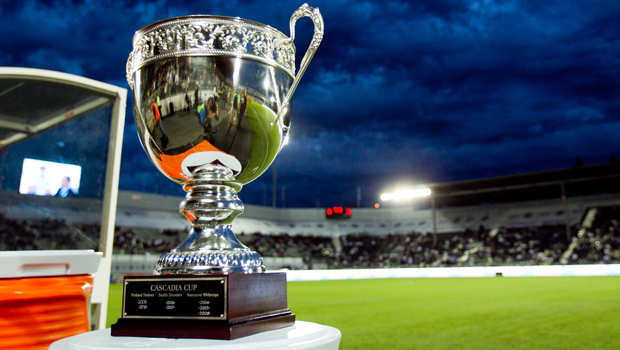 The Cascadia Cup is coming back to Vancouver. For the first time since joining Major League Soccer, Vancouver Whitecaps FC are Cascadia Cup champions after Portland Timbers defeated Seattle Sounders FC 1-0 Sunday night at JELD-WEN Field. By virtue of the result, Whitecaps FC finished atop the Cascadia Cup standings with nine points and a 2W-1L-3D record against their Pacific Northwest rivals this season. Members of the Vancouver Southsiders and Curva Collective, both independent supporters groups of Whitecaps FC, were on hand in Portland to claim the trophy. Winning the 2013 Cascadia Cup makes Whitecaps FC the most successful club in competition history. They have now won four titles since the trophy was first awarded in 2004 – one more than both Portland and Seattle. Most recently in Cascadia play, the ‘Caps humbled Seattle with a historic 4-1 victory Wednesday at CenturyLink Field on the strength of a hat-trick by rookie striker Kekuta Manneh. Earlier this season, the ‘Caps claimed their first-ever MLS victory over the Sounders on July 6 at BC Place, after suffering a heartbreaking 3-2 defeat in Seattle just a month earlier. Meanwhile, Vancouver and the defending champion Timbers drew each of their three meetings this season. A second-half brace from Camilo, which included his sensational scissor-kick tally, salvaged a point for the ‘Caps in a 2-2 draw with the Timbers last weekend at BC Place. Camilo led all scorers during Cascadia play this season with five goals in six matches. The origins of the Cascadia Cup date back to when Vancouver, Portland and Seattle were members of the United Soccer Leagues (USL) First Division. The combined supporters of the three clubs created the two-foot tall silver Cup, which is awarded annually to the team with the best head-to-head record over their Pacific Northwest rivals in regular season matches. The ‘Caps won the first two editions of the competition in 2004 and 2005 and added a third title in 2008. Now, the Cup is coming back to Vancouver – something Rennie said the fans truly deserve.